Russian security forces have killed four militants in two separate shootouts in the country's North Caucasus region. In the republic of Dagestan, two men were cornered in a house and were killed in an exchange of fire. 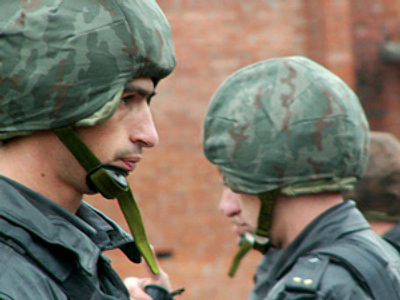 The incident happened during a search operation in a village of Komsomolskoye in the Kizilyurt district of Dagestan. A source in Dagestan’s Interior Ministry told Itar-Tass news agency that two policemen sustained minor injuries in the operation. According to the source, identities of the killed have been established but cannot be disclosed for investigative reasons. The operation was conducted following the recent attack against the police in the Kizilyurt district. A policeman and his brother were injured in the incident. In another development, two militants have been killed in the neighboring republic of Ingushetia. The men opened fire at police when their car was stopped for a security check. The militants are associated with a number of terrorist crimes in the republic, spokesperson for the FSB department for Ingushetia told Interfax. Despite authorities' efforts to crack down on the terrorists, Russia's North Caucasus remains volatile. On Tuesday, militants stormed the Chechen Parliament, killing three people. All of the attackers were shot by security guards. Life or death: will Russia resume death penalty?